I saw a post today on Facebook that reminded me of the Purple Helmets, a stunt riding team based out of Castle Winthrop on the Isle of Man. Anyhow, have a look at a few of their videos and you can easily tell these guys have some skill at riding, and it would appear even more so at tossing them back at the pub while dreaming up ideas for their show. 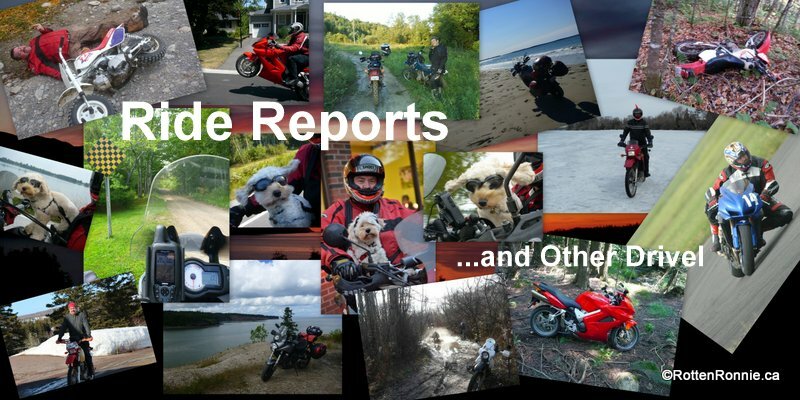 The promise of spring was in the air sometime last week, but today it is nothing but winter and I'm itching to get out on my motorcycle and do some more weekend touring around this part of Atlantic Canada. "No battle plan survives contact with the enemy". What you can take away from this, is to test your gear in the comfort of your home or out on your front lawn before you haul it 8000km and find out it fails miserably or needs modifications. I'm rationalizing my excuse to play with fire and relieve the boredom of a cold Sunday afternoon on Prince Edward Island, and I can live with the laughter and pointing fingers. 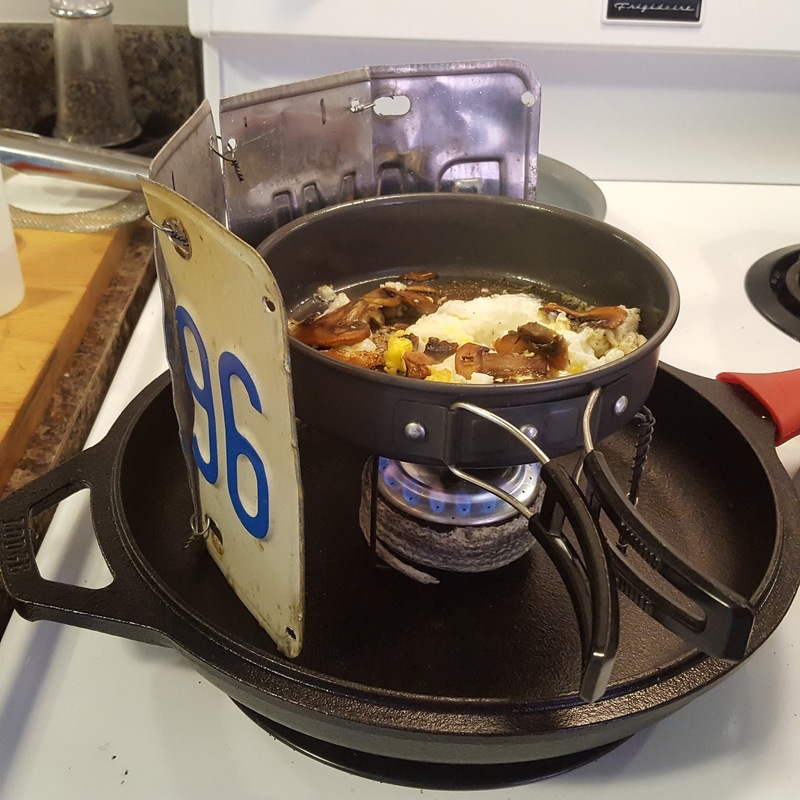 Right, the mission is to use a homemade alcohol stove, pot stand and windscreen with 1oz of alcohol to cook sliced mushrooms, fry an egg on top of it, then to use my "brand new never been used" folding wash basin that I purchased on AliExpress over the winter months. It was well past my lunchtime and I have to admit, I've been frittering away my time today on Facebook posting to the Motorcycle Camping Canada group, when I got a bit peckish and decided it was time to line my ducks up in row and test out a few pieces of gear to see how well they worked in the comfort of my kitchen. 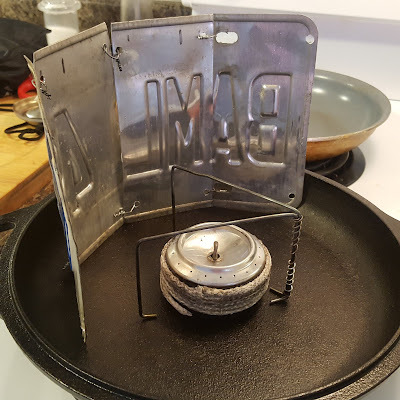 I rounded up my homemade windscreen, pot stand, and a penny stove that I had purchased on FleaBay years ago when I considered using an alcohol stove for my trip across the Trans Labrador Highway, and proceeded to make a mess. 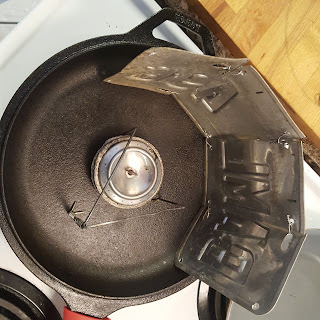 I decided that I could get away with an once of fuel in the miserly penny stove, but forgot that this needed to be preheated by dribbling alcohol around the preheating cord wrapped around the stove, so I probably ended up using about 1.5 ounces of fuel all told. Lesson 1: You are going to use more fuel than you expect or planned for. I lit it up and watched it bloom into life, placed my relatively new frying pan on top of the pot stand only to have it tip backwards and fall off, as the balance was wrong, so I had to rotate the two legged pot stand to provide more support underneath the heavier handle side of the frying pan. Lesson 2: Make sure the pot is going to do the job or dinner ends up in the grass, and becomes dinner for someone else. There's no wind in the apartment, but let us pretend, shall we? I added about a teaspoon of olive oil to the pan, tossed in a sliced mushroom, and watched it almost immediately begin frying... At too high a heat! 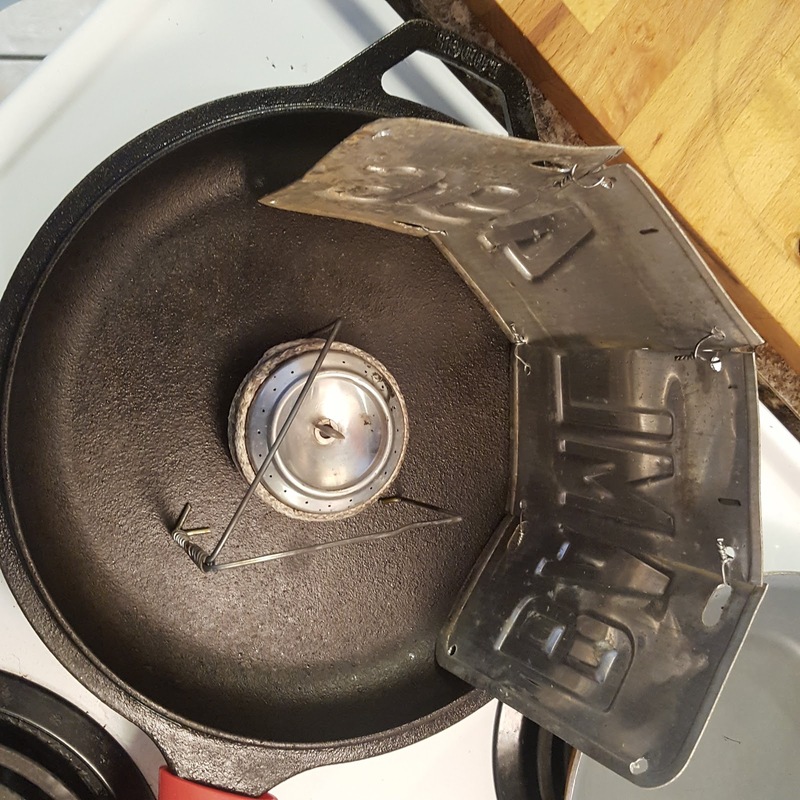 It was cooking away at about a medium heat in comparison to a stove top, when ideally I would have preferred a med-low heat. Lesson 3: An adjustable flame would be nice, or failing that, a height adjustable pot stand would work. With other alcohol stoves, you can add a few drops of water to tame the intensity of the flame and make it into a nice low heat. 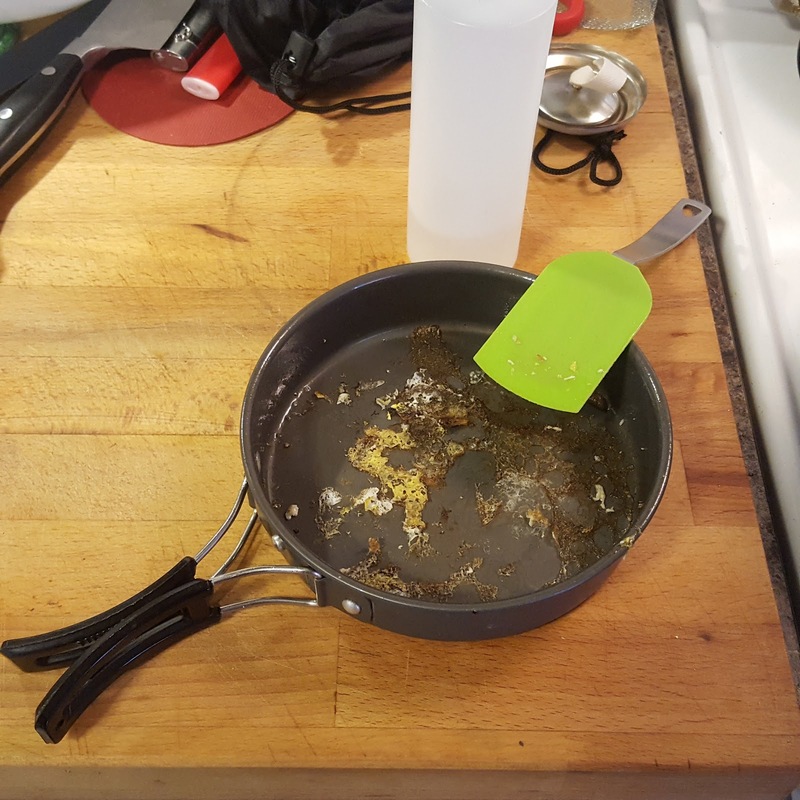 The 1/2 teaspoon of oil was quickly disappearing, and if I cracked the egg into the pan it would stick like glue. I quickly added another 1/2 tsp of oil and cracked the egg over it carefully so as to not upset the apple cart again. Lesson 4: Use more oil when cooking with fire and thin aluminium pans. A dash of salt and pepper, and it cooks away, but not evenly so I moved the pan until the bulk of the egg was over the flame. 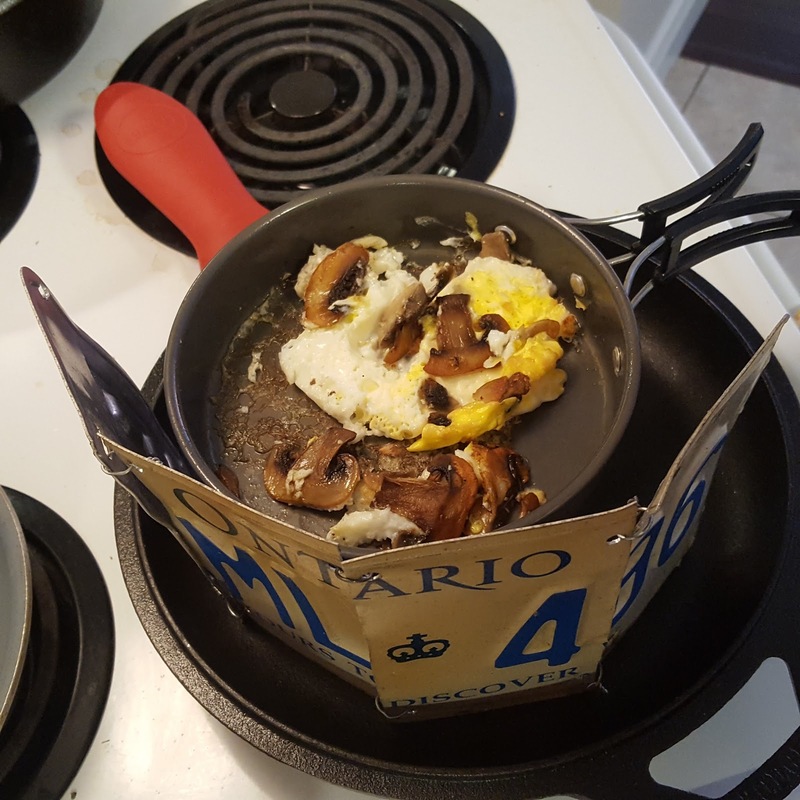 And I added a tsp of water into the pan to use steam to heat the egg through, but hadn't thought far enough to arrange a lid that would cover it and keep the steam in. Lesson 5: Have a lid handy. A pot lid, a tin place, a piece of foil. The flame is dying and the egg is just about done. Lunchtime! I turned out the egg and shrooms onto a plate, removed the pan from the heat and let it cool down slightly while I got my washbasin ready with room temperature water and a drop or two of soap in it for suds. In the bush it would probably be cold water I'd wash up with unless I needed serious cleaning power of hot water. No worries there, I tossed a litre of water into the wash basin and it looked as if that were just right for a wee morning clean up. The egg was yummy and went down so easily that I've plans for doing another once I get this posted, perhaps with my butane gas stove or a trangia clone and simmer ring? Yep. Stuck on overcooked egg. This was going to be a serious test of the wash basin, for getting overcooked egg off a fry pan is a touch chore even for a well appointed kitchen. I certainly wasn't prepared for the elbow grease necessary to scrub out the pan with my scrubby sponge (cut in half for smaller camp weight), and scrubbed away merrily. All while learning that you have to be careful not to push down the edges of the wash basin with the pan or your wrists. Lol. Lesson 7: Bring a more aggressive scraper or soak in water longer. 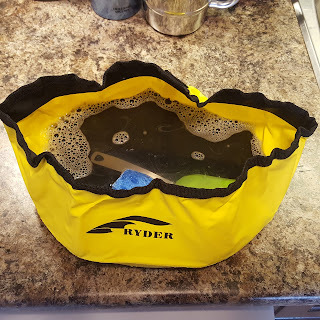 Boil water in the pan over the stove, THEN clean it? Lesson 8: Please keep hands and legs (and frying pans) inside the ride at all times to prevent accidents. It looks weird, but it works quite well! 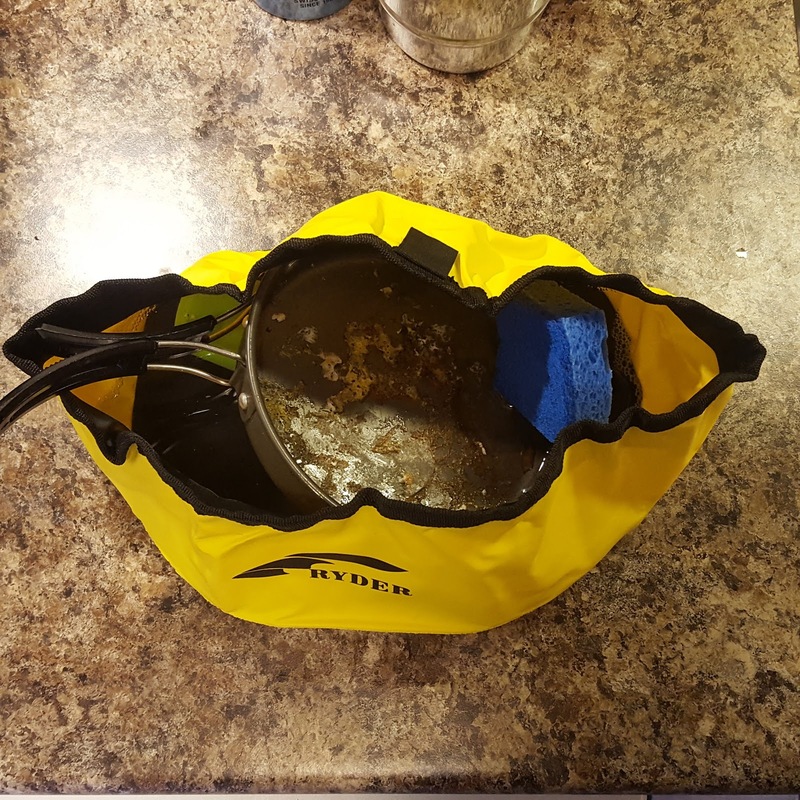 The wash basin was a great add to my moto camping kitchen, and performed up to expectations. I give it a four out of five stars! I had fun playing around this afternoon, but feel free to laugh, and post a comment to correct the error of my ways. Would I use this setup on a trip? 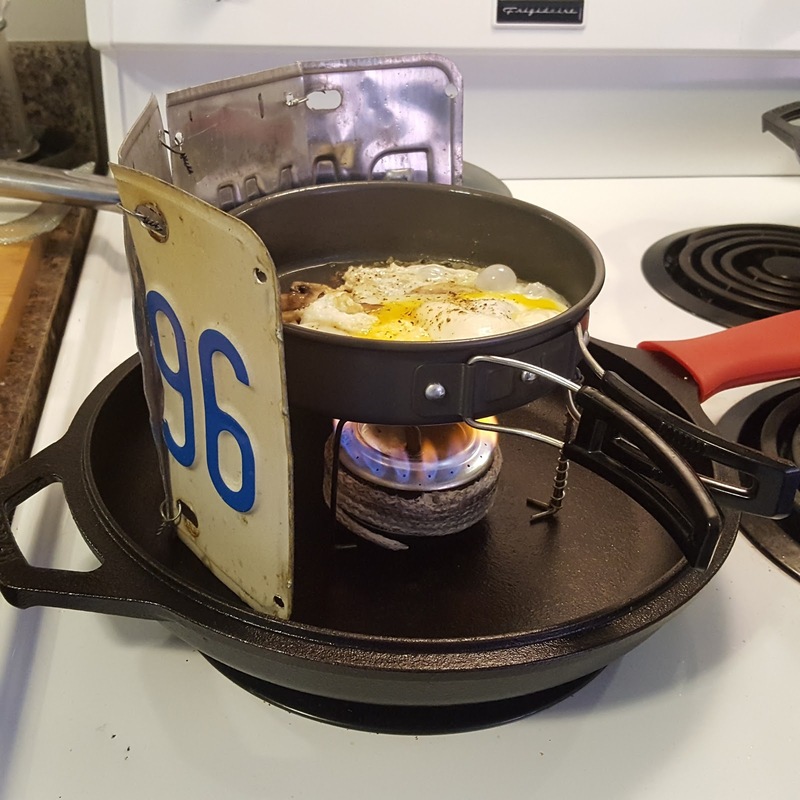 A weekend campout perhaps, but as the flame needs to be tamed down, that is what I'll focus on next time, using a stove that I can control the heat with to delicately simmer scrambled eggs in butter, right up to boil up a pint of water for a cuppa and some oatmeal for breakfast. I'm going to repeat this experiment with a Trangia clone and pot stand, making use of the simmer ring.